It's the middle of February. Spaniel and handler are hit with a bad case of cabin fever. What do you do? The Mid-Atlantic Hunting Spaniel Club (M-AHSC) held a "grouse" trial as a warm-up for the coming spring trial season and as a great excuse to get out of the house. This year, it took more than an excuse - for some, it took real motivation. Mid-Atlantic's trial was held on February 15th, the day before a massive snowstorm buried the East Coast. The forecast of this storm kept many away, along with 4 inches of fresh snow the night before. Still, many hardy souls braved the elements and were rewarded with a beautiful - albeit brisk - day in the woods with excellent scenting conditions. 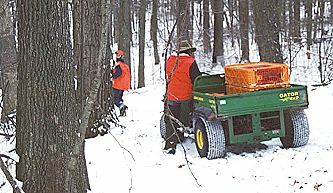 This year's Grouse trial was held at the Mason-Dixon Game Farm near Glen Rock, Pennsylvania, which is northwest of Baltimore, Maryland, just across the state (Mason-Dixon) line. This was the fifth time that the club has put on this trial in about seven years. The trial was held in a wooded hollow that has been used for cocker trials in the past. This is a young oak and mixed hardwoods habitat with a lot of greenbriar. A trail down the middle divided the woods into two courses and allowed the gallery to walk along. Although called a "grouse trial", the trial is run with Chukar Partridges. How does one plant a Chukar in four inches of powder snow? Very lightly! The bird planters did an excellent job, but fortunately the clumps of greenbriar gave the birds some holding cover. Most all of the runners just headed for the briars. The gunners often have the best view of the birds at an event such as this. According to one: "I thought it (the snow) would make the bird planting hard, but they seemed to hold. When they did move, it was into cover or they would duck down when they heard the dogs coming. I saw a lot of birds hunkered down, hiding by a tree, which is what grouse love to do." Most of the dogs took the greenbriar in stride. Some actually relished going into the thick stuff. From the gunner's perspective, "I saw a few that looked as though they have never seen cover like this. Those dogs weren't in the placements. That's why it's a Grouse Trial. 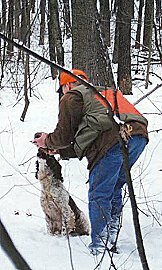 If I'm hunting grouse, I want my dog in the briars, brush and downed tree tops, not running around in the open woods." Although humidity levels the week before the trail were very low, the approaching storm brought gray skies and moist air, along with a light breeze. Temps, around freezing, actually felt moderate compared to the last few weeks. Scenting was excellent and this made the trail especially exciting with some big finds. Some of the dogs make some nice finds on downwinds, which was a real challenge for the handler trying to find a balance between range and efficiency. With the thick cover, you could not let the dog move out as far as in a field, but the dog had to pass the bird and work back in order to find it.